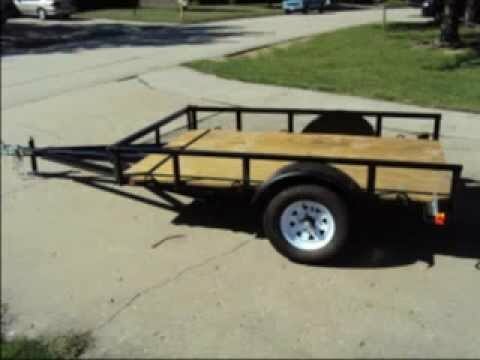 Drop Deck Trailer Plans? Anyone? Looking for plans for a Drop Deck trailer Similar to the Air-tow, HLG or JLG. anyone know a source. Yea, I used an air-tow to bring my Tormach 1100 CNC Mill Home worked nicely just wish I was able to have kept it for another day or a few more hours for measurements but trailer was reserved my another so had to get it back asap to rental co. This is EXACTLY what I did when I built my utility trailer........except I didn't need to rent one due to the simplicity of the trailer that I was making. 10) Got trailer inspected at official station ........ and...it FAILED! I didn't put marker lights on it! ARGH! 11) Fixed my failed inspection issues and went back to pass. 12) Parked it in garage for 6 months without use because I didn't want to scratch it. (you should see it now) I've put that thing through HADES! 13) Posted on Millerwelds.com in order to help you out......or at the least...... get unpleasant feedback from trolls. J/K! ....maybe. Here's an old video / slide show style.... that shows my build.